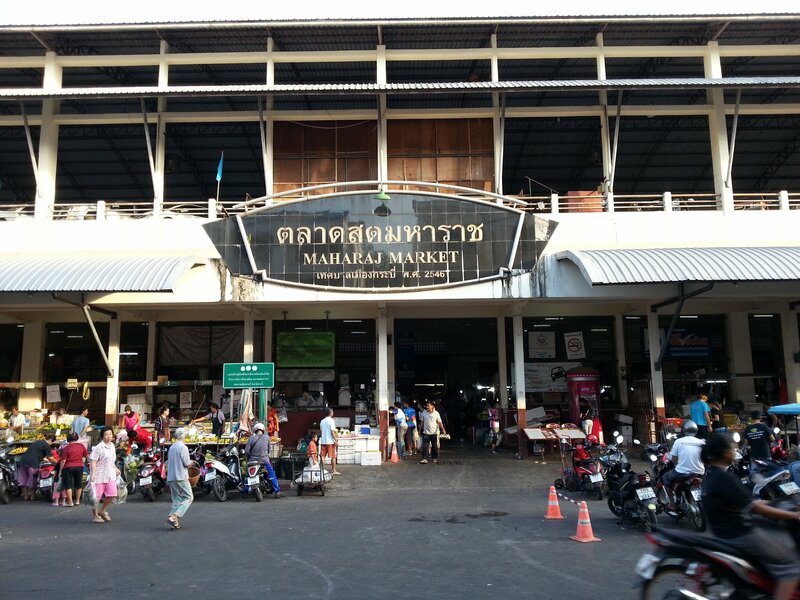 Established in 2003, Maharaj Market in Krabi is by far the largest food market in Southern Thailand with a fantastic range of locally produced ingredients and cooked foods. Maharaj Market is a morning market open from 03:00 until around 10:00 by which time nearly all the traders would have packed up for the day. 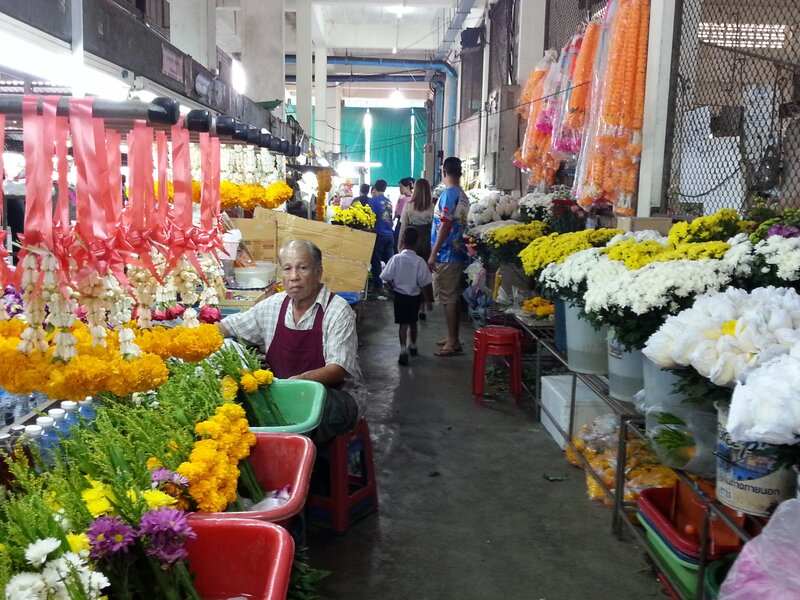 Maharaj Food Market is not a tourist attraction, although it’s a fascinating place for visitors to come to. Maharaj Market is where local people come to buy their food, generally in bulk, and often for restaurants or large scale catering operations for hospitals and the such like. 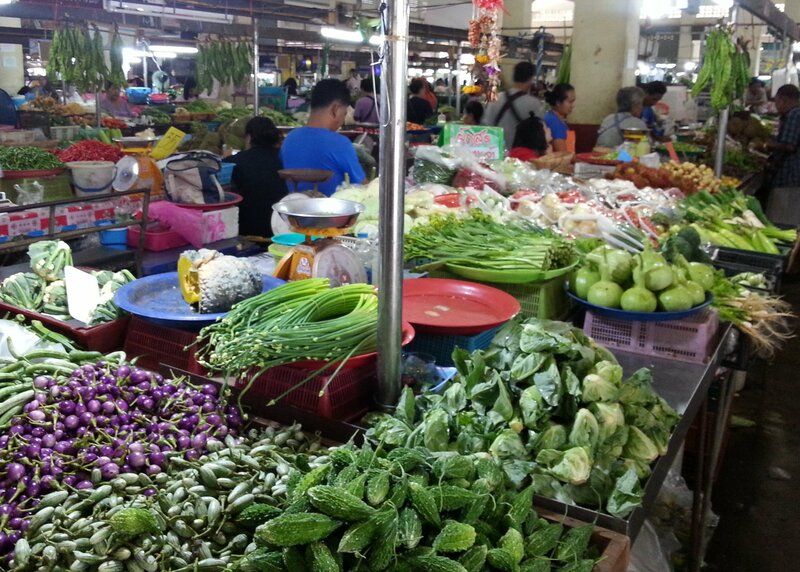 Most of the produce on sale is local and its suited to the local palate. 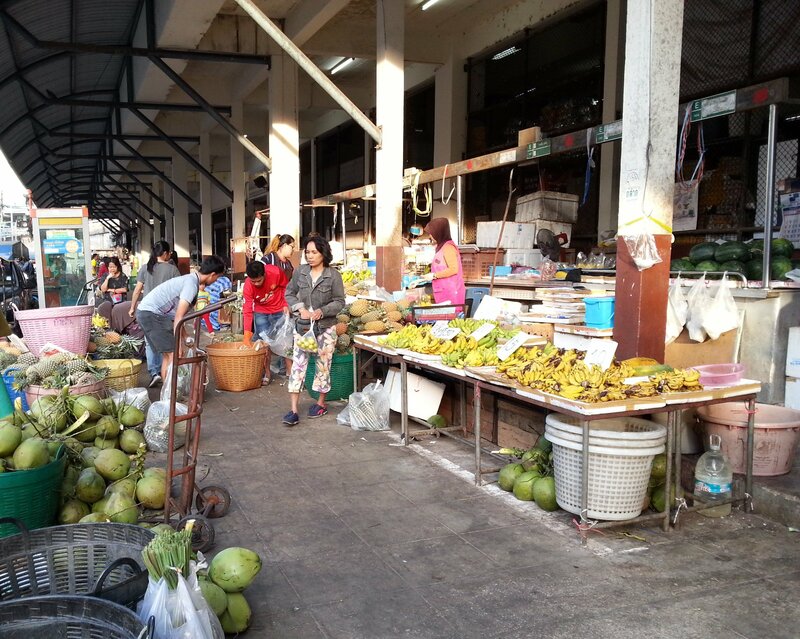 Maharaj Market is a cultural experience and a daily celebration of the things local farmers grow or the river or sea yields to the Southern Thai fishing industry. 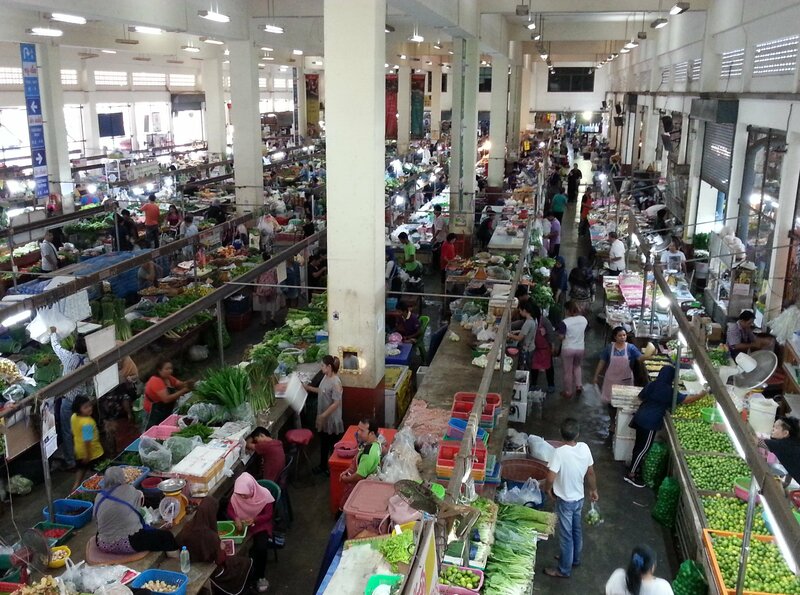 Maharaj Food Market is contained within a large building with very high ceilings giving the market an airy feel despite the absence of fans and air-conditioning. So large is the market it’s split into signed posted sections, each occupied by clusters of vendors with the same or similar type of product on sale. The fierce competition keeps prices at a low level. Before you even enter Maharaj Market all the surrounding streets are busy with people loading and unloading goods from the very hours of the morning until around 09:00. The perimeter of the market is also where you find lots of pavement fruit sellers with a few products each on sale at very cheap prices. These pavement vendors tend to be the very small scale producers looking to sell their fruit directly in too small a quantity to make it economically viable to rent a stall inside the market itself. As you enter Maharaj Food Market the first section you come to is the vegetable section, which takes up about 40% of the total floor space of the market. 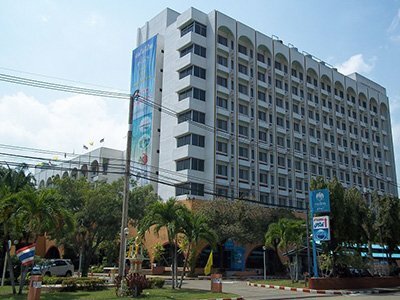 Krabi, like much of the South of Thailand, has a hot and humid climate with a good water supply and rich fertile soil making it an easy place to grow certain varieties of plants, fruits and trees in abundance. The vegetable section of Maharaj Food Market is an educational experience for anyone interested in authentic Thai cuisine, particularly Southern Thai cuisine, as the cuisine in Thailand is very much based around what grows locally and Southern Thailand has some very unusual vegetables, herbs and fruit which flavour the food. 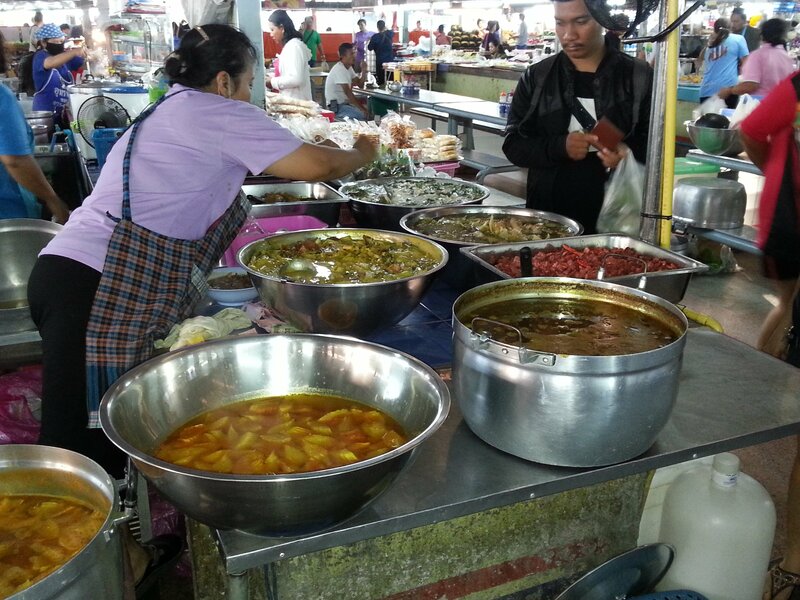 Everything that is used in Southern Thai cooking is on sale at Maharaj Food Market. 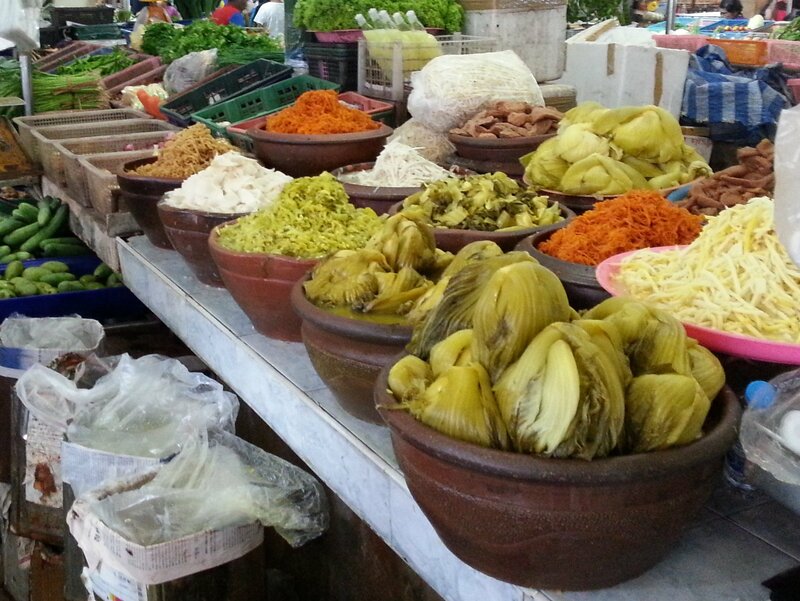 One of the unique cooking ingredients in Southern Thailand is the pickled vegetables and these are sold in bulk at Maharaj Market. In particular try the pickled green mustard, which is used as an accompaniment to lots of Southern Thai rice and noodle dishes. You can buy tinned pickled green mustard but unsurprisingly its nowhere near as good as the fresh product from the market. Beyond the vegetable and fruit sections, the other major products on sale at Maharaj Food Market are seafood, pork, beef, chicken and flowers each sold in separate areas to avoid offending religious sensibilities. 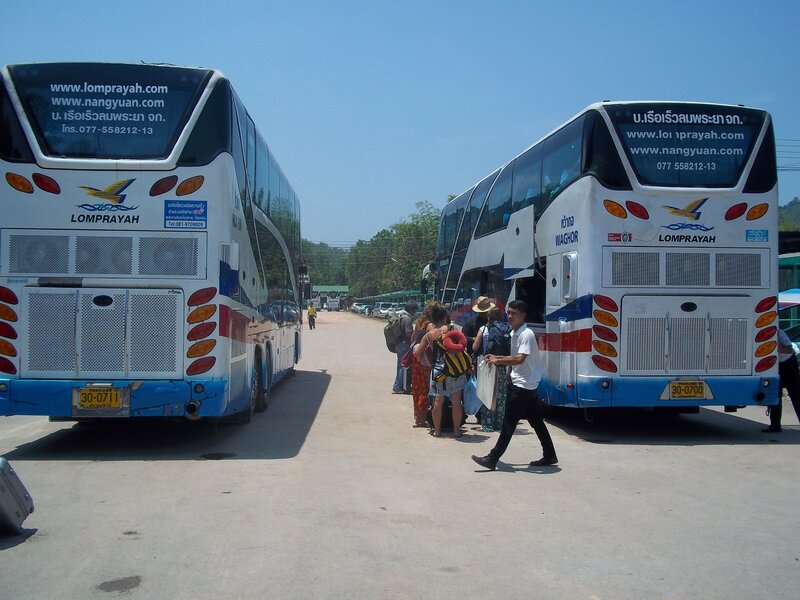 Krabi has a large Muslim population which coexists peacefully with the Buddhist population. 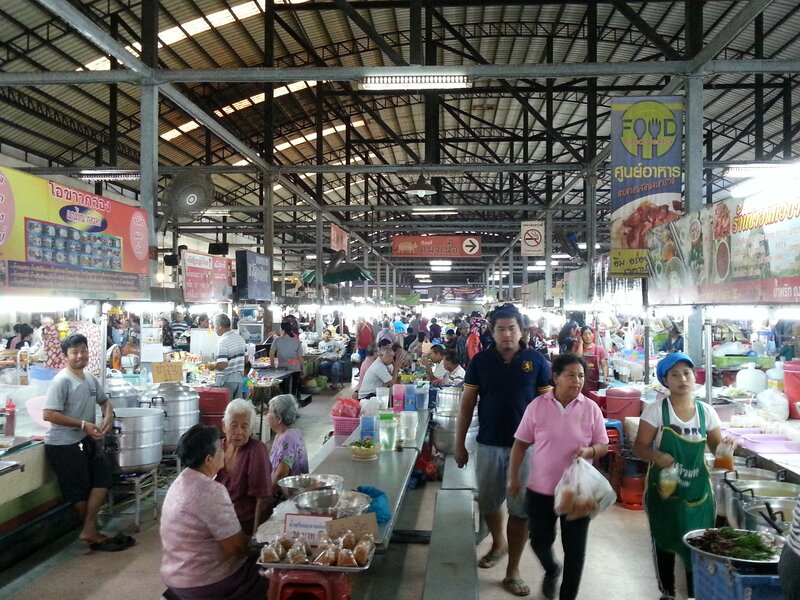 Indeed, this mix of cultures has widened the diversity of Krabi’s cuisine and the dual Muslim and Buddhist Thai culinary traditions are evident as you look around Maharaj Market. Maharaj Food Market also a large food court frequented by the sellers and buyers, as well as local people who come to the market on a daily basis to great cheap local dishes and perhaps also to soak up the vibrant and life affirming atmosphere of the market. If you are staying in Krabi Town then definitely head over to Maharaj Food Market for breakfast, it’s by far the best place to eat breakfast in the town centre. Aside from these mainstays of Thai street food, there are also more modern and innovate food stalls at Maharaj Food Market. 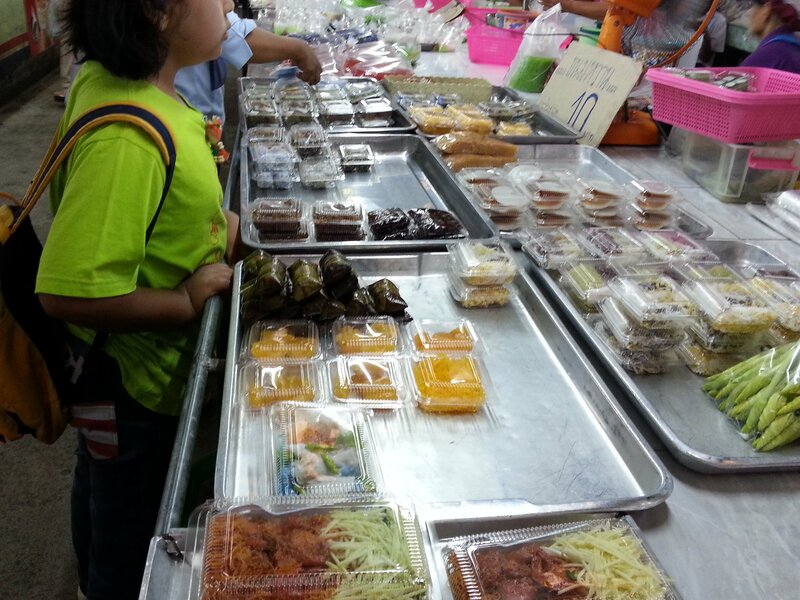 There is a good range of cakes on sale in the food court ranging from traditional Thai khanom wan to more European style cakes, which some interesting part European/part Thailand products bridging the two culinary styles. 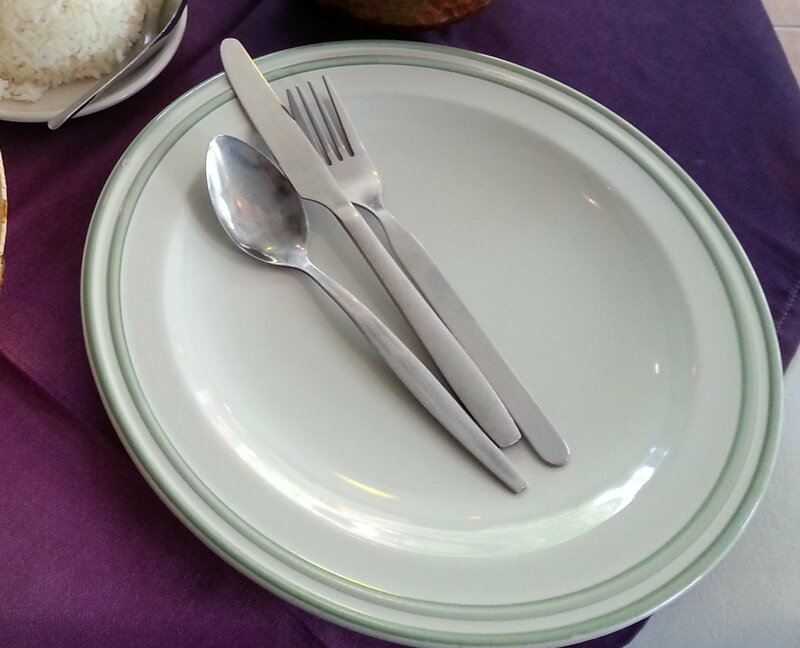 There are also salads, sandwiches and take-away boxes containing a mix food types which look perfect for a picnic or perhaps the long boat trip from Krabi to Koh Lipe. 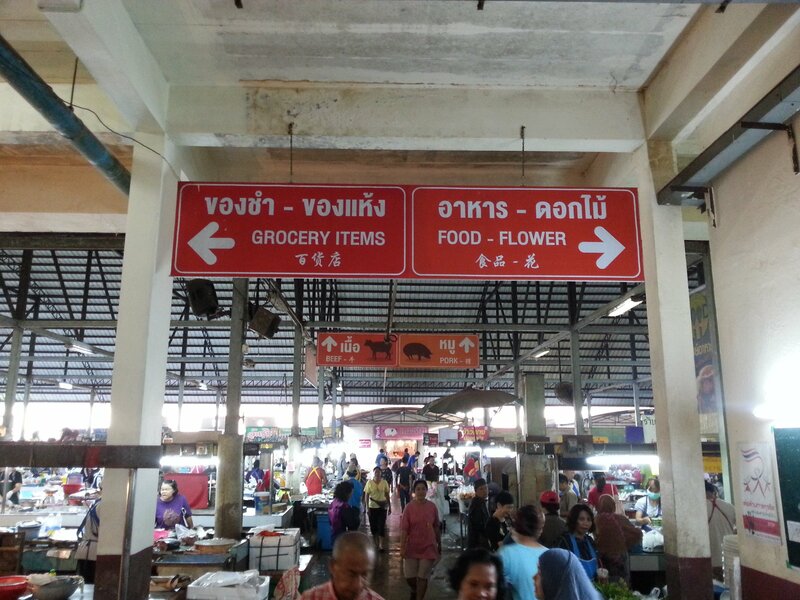 Maharaj Food Market is 4.7 km from Krabi Bus Station.